Faced with a formidable list of nominees for the annual Excellence in Research Prize and Medal, the Board of Overseers opted this year for its own brand of novelty and innovation: the prize committee picked three. The sector-spanning winners, all at the forefront of their fields, included a solar physicist, a chemical engineer and a neurobiologist. Dale Gary, distinguished professor of physics in NJIT’s Center for Solar-Terrestrial Research, was awarded for his groundbreaking research on solar flares and for the creation of a radio telescope, composed of 15 antennas spread out over two kilometers, that is able to peer into their genesis. “We want to understand the initiation of a flare – what starts it off,” says Gary, who studies fundamental physical processes occurring on the Sun that produce radio emissions, while also examining them for clues about the mechanisms that accelerate charged particles to high energies in solar flares. The director of NJIT’s Owens Valley Solar Array (OVSA) radio facility near Big Pine, California, he is a leader in the use of solar radio data to examine conditions under which radio bursts associated with solar flares disrupt cellular telephone signals emanating from cell tower sites. He was involved in the discovery that these bursts also cause failures in Global Positioning System (GPS) receivers, which can affect GPS services over the entire sunlit hemisphere of Earth. His research is essential to understanding and mitigating these effects. “Some of the most harmful effects to Earth are not visible,” he noted. Edward Dreizin, distinguished professor of chemical engineering, was tapped for his research into novel energetic compounds for use in advanced propellants, explosives and pyrotechnics. In his Reactive and Energetic Materials Laboratory, Dreizin creates many of these compounds by milling together distinct metal-based materials into tinier and tinier particles, generating nanocomposites with unique properties that combine high-density energy with extremely high reactivity exceeding that of existing fuels. Applications range from metastable alloys that serve as biocidal agents to neutralize anthrax, for example, to propulsion for both large space exploration ships and for smaller devices capable of carrying larger payloads than is now possible. Farzan Nadim, professor of neurobiology and a founding director of NJIT’s Institute of Brain and Neuroscience Research, was awarded for his fundamental insights into the mechanisms by which synaptic dynamics contribute to the generation and control of oscillatory neuronal activity. He has helped identify new mechanisms, for example, through which a fast and a slow oscillatory network coordinate their activities; widespread synchronization of rhythmic activity among networks of neurons that normally produce distinct behaviors can lead to disorders such as generalized epilepsy and Parkinson's disease. “With schizophrenia, for example, the level of neural oscillation is completely off,” he notes. In his Neural Dynamics Laboratory, Nadim studies the neurophysiology of the stomatogastric ganglion, a small central-pattern-generating (CPG) circuit in lobsters and crabs. CPGs are neuronal networks in the central nervous system that generate the basic patterned electrical activity underlying most rhythmic behaviors like walking and breathing in all animals. By elucidating the crustacean nervous system, he aims to uncover fundamental principles that govern neural processing across all animal and human nervous systems. “How it happens is the same with humans and crustaceans,” he notes. 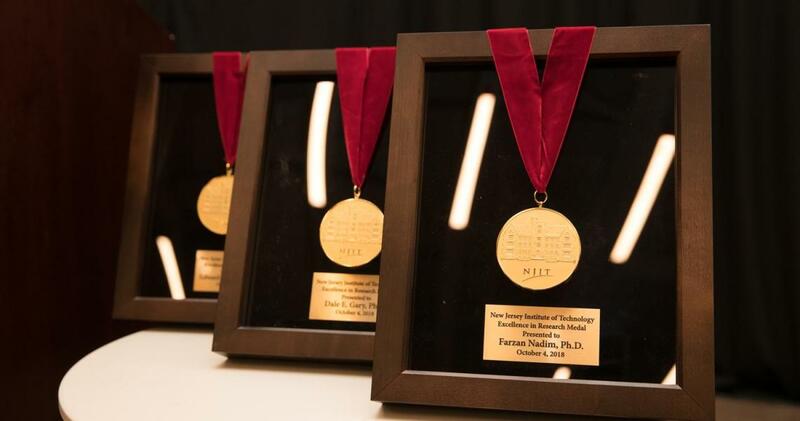 NJIT President Joel Bloom, who bestowed the medals along with John Seazholtz ’59, chair of the university’s Board of Overseers, lauded the three researchers for their hard work, prodigious talent and deep commitment to working across disciplines and industries.